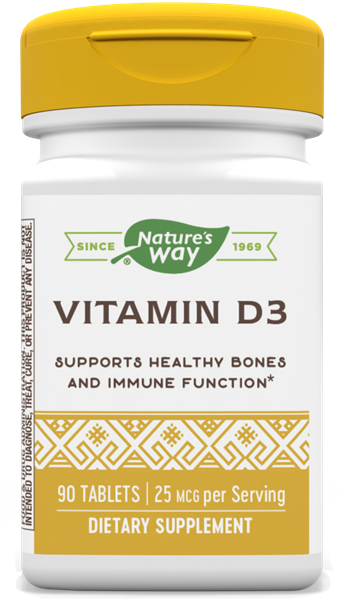 Vitamin D3 - 1,000 IU / 90 Tabs - Nature's Way®. Vitamin D3 provides an easy way to increase intake of cholecalciferol - the same form of vitamin D our bodies create. Take 1 tablet daily. May increase to 1 tablet twice daily or as recommended by a healthcare professional. Best when taken with meals. Caution: Consult a healthcare professional if you have a kidney disorder, hypercalcemia, hypercalciuria, are taking any medications, or are pregnant or lactating.